I’m pleased to inform you that a delegation of U.S. Dominicans will travel to Iraq in late September, almost a year after having had postponed their trip because of instability in Iraqi Kurdistan. The funds your congregations and provinces so generously provided a year ago will fund this trip and provide a donation to the Dominican Family in Iraq as well. We have no need to request additional donations. Read on for more about the delegation and about an opportunity for you to observe the fourth anniversary of the displacement of thousands of Christians and other religious minorities at the time of the ISIS invasion of Iraq. The delegates are Sister Rose Anne Schlitt (Adrian), Sister Nancy Jurecki (Adrian) and Gloria Escalona, a member of the St. Albert the Great Chapter of Dominican Laity in Oakland, Calif. Gloria was a member of a previous delegation to Iraq in 2001. Sister Rose Anne lived with one of the members of the Iraq congregation during a period of ministry in Rome. Sister Nancy is chief mission officer for Providence St. Joseph Health, Southern California. She was an alternate for the postponed trip and will join the September delegation because Sister Catherine Waters (Caldwell) is unable to participate at this time. Further communication about the details of the delegation will be forthcoming. 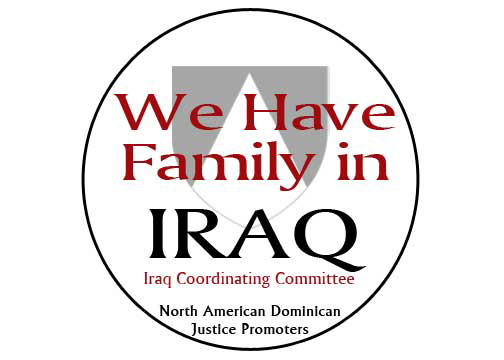 News about the delegation can be followed at facebook.com/WeHaveFamilyInIraq2017 and on the DSC website. Monday, August 6, is the fourth anniversary of the exodus of Christians from Nineveh Plain because of the invasion of ISIS. Recently Sister Nazik Matty, a scripture scholar and member of the leadership team for the Sisters of St. Catherine of Sienna, Iraq, presented a paper on the sisters’ experience of return. The paper Cracked but Still Standing (attached) was presented at an annual conference of Catholic laity in Germany (Nazik considers this a work in progress; thus, it is marked as a draft). Nazik’s powerful work can be transformative for Dominicans in the US. To that end, the Iraq Coordinating Committee has prepared the attached reflection guide for your personal or communal study. Should you wish, you are encouraged to make a written response to our Iraqi Dominican family and send it to Sister Kathy Nolan no later than August 30. These comments will be translated into Arabic and carried to Iraq by the delegates. Then, you can look forward to an opportunity to engage with the delegates after their return via a national video conference call. Details of that call will be communicated at a later date.